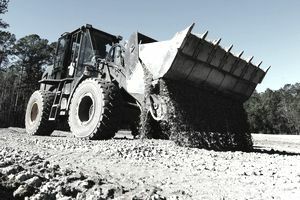 Equipment Operators in the Navy operate heavy transportation and construction equipment including trucks, bulldozers, backhoes, graders, forklifts, cranes, and asphalt equipment. They're like the construction foremen of the Navy, with duties similar to workers at quarries or construction sites. These sailors operate a wide variety of heavy-duty, self-propelled construction equipment for projects that include everything from building, roadway and pier construction to grading and excavation. That includes conducting maintenance and safety checks, and of course, preparing reports. Navy equipment operators (EOs) may also serve as members of a crane crew to rig cable assemblies and change attachments for various lifting and pile-driving operations, using and operating rock crushing and well-drilling equipment, reading and interpreting blueprints, and performing as blasters for construction projects. EOs are almost guaranteed to work in a variety of conditions, independently and as members of a large team. Their many different duties may be performed in climates ranging from tropical to arctic. Expect to spend a significant amount of time outdoors if you decide to enlist in this job. After completing the requisite basic training (boot camp) at the Recruit Training Command in Great Lakes, Illinois, these sailors attend 92 days of technical school (known in the Navy as A-school) at Fort Leonard Wood in Missouri. During A-school they'll learn the necessary procedures and protocols for handling and operating the Navy's heavy equipment, and get the permits they need to operate the equipment safely when in the field. To be eligible for this rating (as the Navy calls its jobs), you'll need a combined score of at least 140 on the arithmetic reasoning (AR), mechanical comprehension (MC), and auto and shop information (AS) segments of the Armed Services Vocational Aptitude Battery (ASVAB) tests. There's no Department of Defense security clearance needed for this rating since there isn't a lot of sensitive information being handled. But it does carry a 60-month (five-year) enlistment obligation, so you should be prepared for this significant commitment. In addition, sailors need normal color perception to qualify for this rating, meaning you can't be color blind. You'll need a valid driver's license, and a driving record free of DUI offenses and major accidents. Advancement opportunities and career progression, like all Navy and U.S. military jobs, are directly linked to a rating's manning level. Navy personnel in undermanned ratings have greater promotion opportunity than those in overmanned ratings. You'll be qualified for a variety of civilian jobs on construction sites, and any company or agency that uses heavy equipment in its day-to-day operations.